When Subaru decided to redesign the Forester, they knew it had to be more than a facelift to get buyers excited. They redesigned the mid-size Forester from the ground up and it’s paying off big for the Japanese automaker. Sales for the aging Forester were lagging and consumers had gotten tired of the four-door SUV. But what a difference since the launch of the new Forester earlier this year. Sales of the new Forester are setting records every month and June is another record-setter. Buyers are flocking to the new Forester for three reasons. They have reengineered the SUV with the latest technology, and it’s the safest mid-size SUV on the planet. Subaru has also stayed true to their core values of good visibility, cargo carrying ability and versatility. The Forester outscored the new Ford Escape, Honda CR-V, Toyota RAV4 and Mazda’s CX-5 in a recent Consumer Reports rating. There is a lot to like about the new mid-size SUV. The number don’t lie and consumer s are voting by buying the new Forester in record numbers. Subaru reported overall vehicles sales of 39,235 vehicles for the month of June, a 42 percent increase over June 2012. The Japanese automaker also posted best-ever June sales for Forester and Outback models. Year-to-date sales for Subaru total 204,597, 25 percent higher than the same period in 2012. June Forester sales totaled 10,170, a 41 percent increase over June 2012 and best-ever June for the newly-designed model. June was also a record month for Outback sales. Monthly sales for the popular Outback model totaled 12,210, 32 percent higher than June 2012. The brand is doing things right and consumers are responding in a big way. 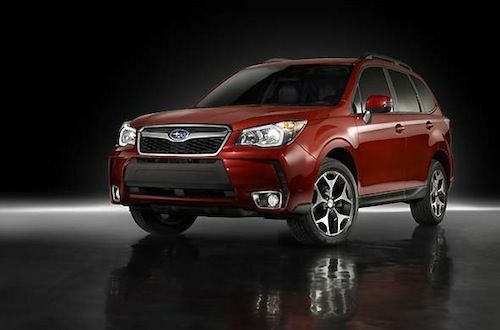 Demand for the all-new 2014 Forester and 2013 Outback is very strong and Subaru knows where their market niche is at. They are engineering quality automobiles and staying true to their core values. They have done a great job of marketing to their key customers and listen to what buyers want. It’s a formula for success that is paying off big for Subaru. We are looking forward to see how consumers respond to Subaru’s first-ever hybrid vehicle when it launches later this year.